March 27, 2019. 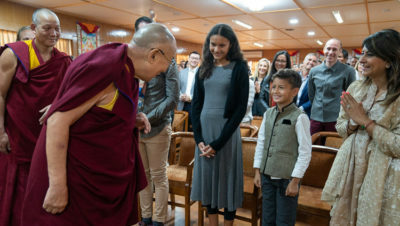 Thekchen Chöling, Dharamsala – A group of eighty-five people from Singapore, including Singaporeans, Americans, Australians, Britishers, Indians, Canadians, Chinese, French, Swiss and several from other countries, came to visit His Holiness the Dalai Lama this morning. They were all members of Club 1880 who are motivated by a wish to change the world, one conversation at a time. His Holiness greeted them all as he walked into the room, but paid particular attention to the children in the front row. He suggested that if people like them, belonging to the 21st century, made an effort to change things through education, after one generation or so, they might see a more peaceful, more compassionate world emerge. Marc Nicholson introduced the group as people from different backgrounds and of different faiths united by the hope to make the world a better place. “Among the 85 of you here and even among all 7 billion human beings everyone has a different face,” His Holiness responded. “And yet we were all born the same way. “Since my childhood, I’ve been learning how to tackle my emotions. Sometimes life has been difficult, but I’ve learned that what really helps is being able to maintain peace of mind. According to the Buddhist concept, it is the nature of samsara, the world in which we live, to be full of problems. But faced with such problems it’s always better if you can keep your peace of mind. One way to do this is to cultivate the awakening mind of bodhichitta, to have concern for others and to remember their kindness. I regard my fellow beings as wanting a joyful life as I do and generate warm-heartedness towards them on a daily basis. We all have Buddha nature and if you think of others as being like you, it’s easy to feel close to whoever you meet. “Whether we are religious or not, we can all benefit from cultivating warm-heartedness. I’ve noticed that those who are more compassionate tend to be more peaceful. If that’s how you are, even when you receive bad news, it doesn’t upset or irritate you. To maintain peace of mind, we need to tackle our disturbing emotions. Just as we learn to look after our physical health, we have to learn to look after our minds too. If you’re physically fit, but your mind is distressed, you’ll be unhappy. Alongside physical hygiene I recommend we cultivate emotional hygiene as well. “We are social animals. We depend on the community in which we live. Our survival and our very happiness depend on our families, neighbours and so forth. These days the whole world is like one community. We share in a global economy, but we also face the challenge of climate change together. We have to consider the welfare of all 7 billion human beings. His Holiness mentioned his commitment to encouraging religious harmony because all religious traditions, whatever their philosophical point of view, convey a message of love. Some believe they and the world are created by God, others believe that everything depends on our own actions. In India, where there is a long-standing tradition of ahimsa or non-violence motivated by compassion, he said, we can see religious harmony in action. “Thirdly,” he continued, “I’m a Tibetan with the name Dalai Lama and six million Tibetans place their trust in me. Although I’ve been retired from political responsibility since 2001, I remain concerned to preserve Tibetan culture. “Tang historians record that in the 7th century there were three neighbouring kingdoms, China, Mongolia and Tibet. The Tibetan king married a Chinese princess who contributed to introducing Buddhism to Tibet. However, he chose the Indian Devanagari script as the model for Tibetan writing. In the 8th century, despite his mother being Chinese, the Tibetan king looked to India to learn more about Buddhism. He invited the great scholar Shantarakshita to Tibet where he introduced the traditions of Nalanda University that we have kept alive for more than a thousand years. “Nowadays, the Nalanda Tradition is really only upheld among Tibetans. Since Shantarakshita encouraged the translation of Sanskrit Buddhist literature into Tibetan, the language was so enriched that it is now the medium best suited to accurately expressing Buddhist philosophy. Asked how to relate to emptiness His Holiness confirmed that this is a key Buddhist concept. When Nagarjuna explained it, he stressed that emptiness does not mean nothingness, it means that things do not exist the way they appear. Things do not exist independently, they are merely designated. Everything is dependent on other factors, including the mind that is not something physical, but exists as a continuity of moments of consciousness. 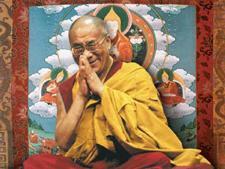 With regard to compassion His Holiness explained that scientists assert that basic human nature is compassionate. He pointed out that young children care little for differences among them, they are simply happy to play together. It’s only as they grow older and begin their education that they learn to observe distinctions. He suggested that modern education would do well to pay more attention to inner values, encouraging children to cultivate and enhance their natural sense of warm-heartedness.